My friend and I are attempting our first fandub. 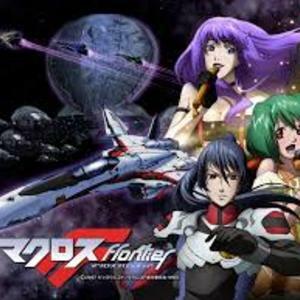 We love Macross Frontier and are excited to see how this will turn out!! We will start with episode one and go from there. The plan is to do the whole series. We will be self casting as Ranka (myself) and Sheryl (friend) and our friend as Luka Angeloni. Sidenote! We eventually want to do covers of different songs that include side characters. So you may end up singing for fun. It does not make a difference in the audition though. Please have a somewhat good quality mic, try for as little static and background noise as possible! Here is the youtube video of the first episode. You will find all the lines in it if you care to look :) But don't just copy the way they say it or anything. Be original, or not, it doesn't really matter. The top ace in the S.M.S. private military company and leader of Skull squadron, he holds the rank of Major. A former N.U.N.S. pilot, he has plenty of combat experience backing him up. He is a fan of Fire Bomber and often plays their songs in his car or while at home, and also named one of Skull Squadron's battle formations after one of their songs ("Planet Dance"). Although laid-back and careless on the outside, he knows when to be serious, and believes that the real duty of a soldier is to care for his subordinates and civilians. He is somewhat overprotective of his sister Ranka Lee, and lies to her about his work so she will not worry about him, telling her he has a desk job in a company's personnel department. 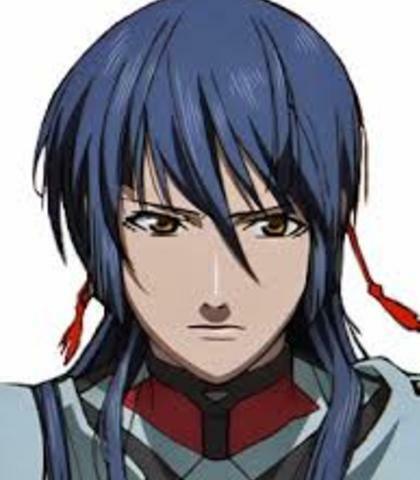 He is actually unrelated to Ranka by blood and is only her adopted brother, constantly blaming himself for the failure of protecting her real family during a Vajra attack on the 117th Large Scale Research Fleet 11 years ago. "(To Ranka on the phone, very proud) For you, I can do anything!" "(Yelling orders) William, call Michael and the others! (to someone farther away) Canaya! We're leaving!" "(To other spaceship. He is wearing a helmet) This is S.M.S Skull Squadron Leader Ozma to New Unified Government Fighter. We are taking control of this area." Proper and strict military sounding guy. Right hand man to Howard Glass. Engaged to Catherine Glass. We will need lots of extras. Can be female or male and any age. We may also have people who are cast say some lines as extras as well. You can also audition as flight attendant here, or a news caster. Just say lines that you either know or think would be in the first episode. "(Paparazzi trying to interview Sheryl. Yelling over eachother. Say anything you think fits)"
"(Vending machine selling it's products. Yelling out in a crowd) Coffee? How about a juice?" "(Pilots getting ready for take off) Launch systems standby, launch systems standby." A high school student in the Mihoshi Academy Pilot Training course. As a result of his fine features and long hair he is often mistaken for a girl at first glance, even receiving the nickname 'Hime' (Princess). 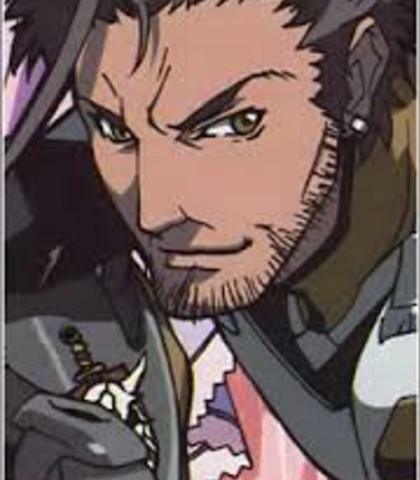 His appearance was revealed to have been inherited from his late mother, Miyo. Despite this, he is otherwise a rather normal, though somewhat aloof and standoffish, boy. Born into a well-known Kabuki family, his persistent yearning for the skies has made for a thorny relationship with his father, who has disowned him. He constantly frets about living aboard Macross Frontier due to the lack of a true 'sky'. 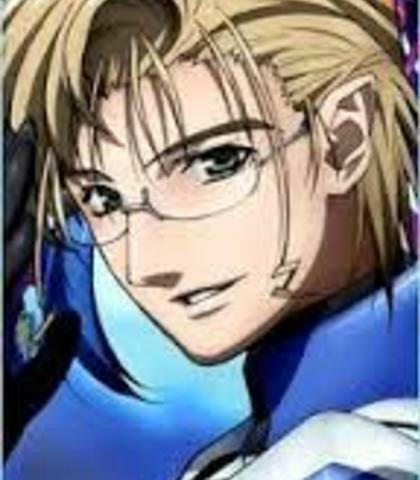 After getting the chance to pilot the VF-25 Messiah variable fighter his flying skills draw the attention of Ozma Lee, who accepts him as a candidate for the S.M.S. Skull Squadron. He develops emotional bonds with both Sheryl and Ranka through out the series. "(angrily) What did you say?!" "(Yelling at Sheryl while being held back) Wait! There's still people inside! Are you going to run away by yourself?" "(frustrated/mad) The sky is so low." Has a calm and mature type voice. 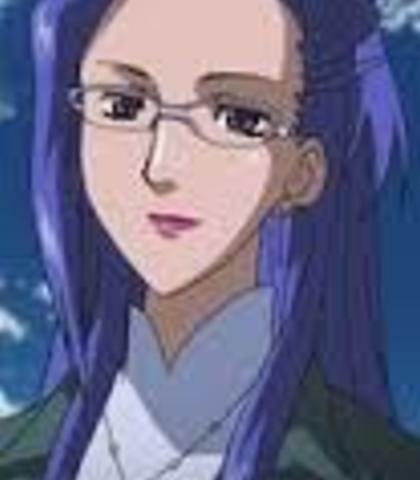 Another classmate of Alto, Michael and Luca, Matsuura is also Ranka Lee's friend. 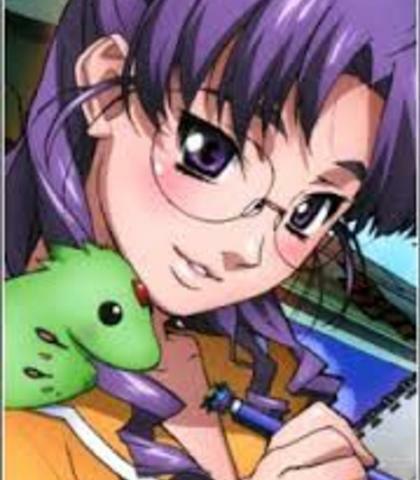 A shy and quiet voluptuous girl with glasses, she also works in the same "Nyan-Nyan" restaurant as Ranka and supports her dream of becoming a singer. Nanase Matsuura does possess artistic abilites and can draw very well too. 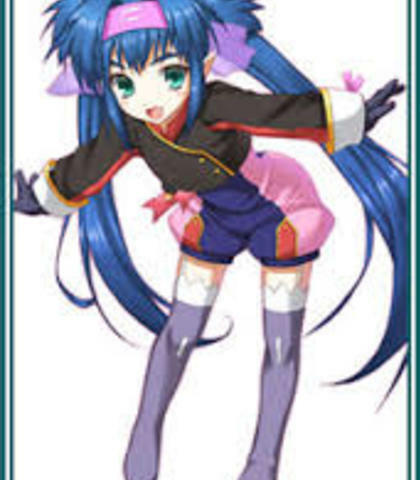 She was recently hired by Grace to become Ranka's costume designer. 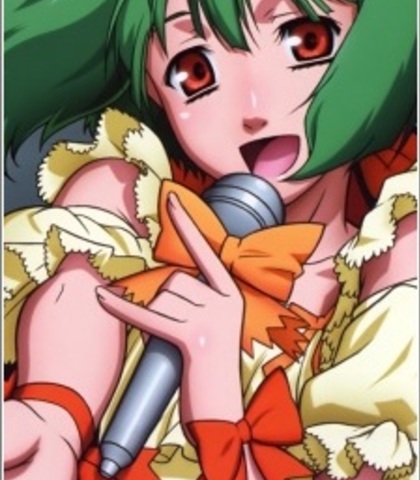 Nanase became severely wounded in her right eye and the rest of her body during a Vajra attack inside Macross Frontier. 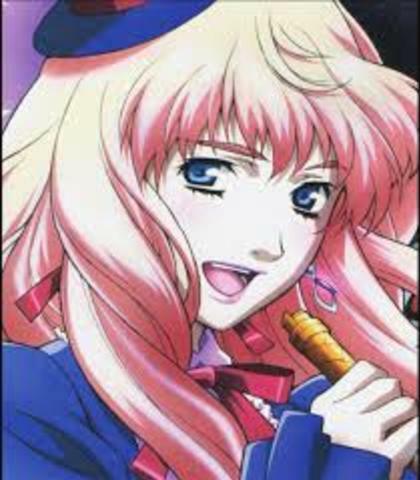 Sheryl Nome took her into a shelter for medical attention, thus saving her life. "(Running. Declining Ranka's invite) Sorry! I have to work today!" Old mustached man. Frontier President. Catherine's Father. "(To Catherine on the phone) If something happens to her, it'll be an interstellar incident. Be careful how you treat her, Lieutenant Glass." "(On phone) Stop them there, no matter the cost. I'll take steps here as well. (To someone in the room) Issue an evacuation order to all ships." "*Sighs* The military can't stop them?" 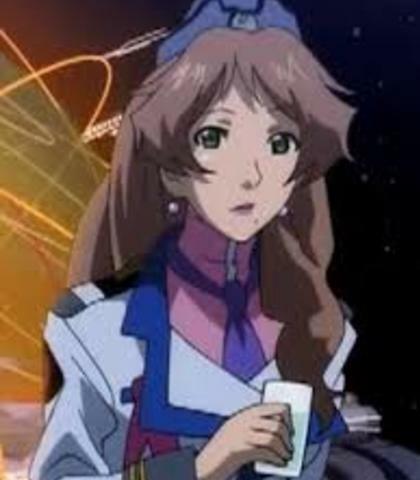 Sheryl's manager from Galaxy Fleet. A person with a gentle and calm attitude. She often upsets her employer despite having considerable abilities. Grace has bio-mechanical implants that allow her to digitally record certain images into her mind, as well as receive cellphone calls directly into her right ear. She is secretly a bad guy. "Wake up, Sheryl...We're almost there." "(To Sheryl) You seem very tired...Should we cancel your interview?" "(Talking to Michael in later episodes. Crying) How can I fall in love...(yelling) When I am so afraid of dying?!" "(Talking to herself before the ... then tough and angrily shouts) I see. You really are...a coward!" 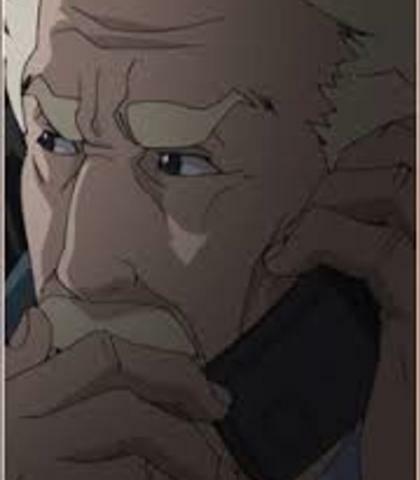 "(On phone) Understood, Mr. President." "(Running to drag Sheryl off stage) *Catches breath* Please hurry. (starts to drag her) Quickly!" It is originally a older male, but anyone can audition for it. If it sounds good we will go with it! "Once, there was a war with a race of giants the Zentradi. Having experienced the threat of destruction from their first contact with an extraterrestrial entity, humanity entrusted its future to expansion into outer space, and set sail to new lands all across the galaxy." Alto's classmate and friendly rival. He is an excellent marksman, and his motto is to always acquire his targets, be it an enemy or a woman—maintaining his reputation as a considerable ladies' man. He is the originator of Alto's nickname, "Alto Hime" (Princess Alto). 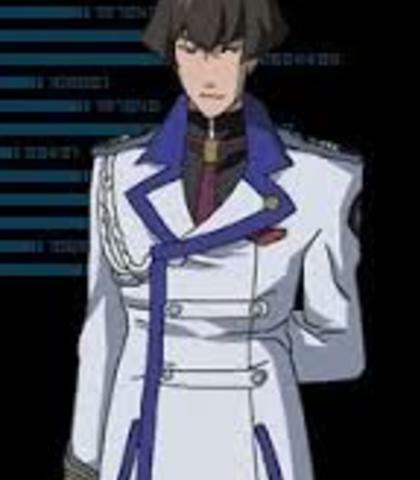 Aside from leading a normal school life, he is also the 2nd Lieutenant of the S.M.S. Skull Squadron and pilots a blue VF-25G (gunner/sniper version). He initially expresses doubt over Alto joining the Skull Squadron, but later accepts him. For normal daily life he wears corrective glasses. His older sister Jessica took care of him since childhood after their parents died, but she commited suicide a few years ago after being disgraced by a friendly fire incident. 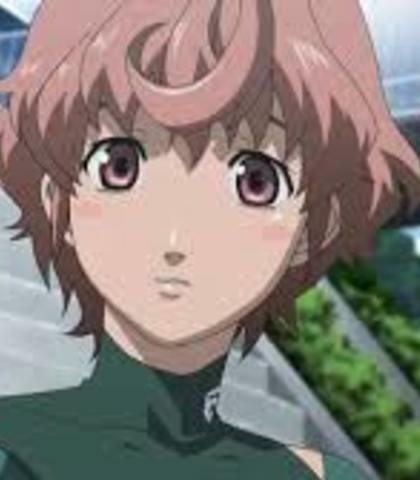 Michael is also one of the most observant characters, noticing the love triangle between Alto, Ranka, and Sheryl as well as catching on to Grace's insidious plot behind the scenes. Childhood friend of Klan Klan. "(teasingly) You're confidant as always, Princess Alto...You're so cute when you're angry." "(angrily after almost getting hit in the head with a giant paper airplane) Hey! Alto!" "(calming and in a 'can't help it' manner) Don't get so mad, Luka. It's the level of work we're at."